"Most of us don't want to change…" Another incredible peek inside the mind of Nick Cave! 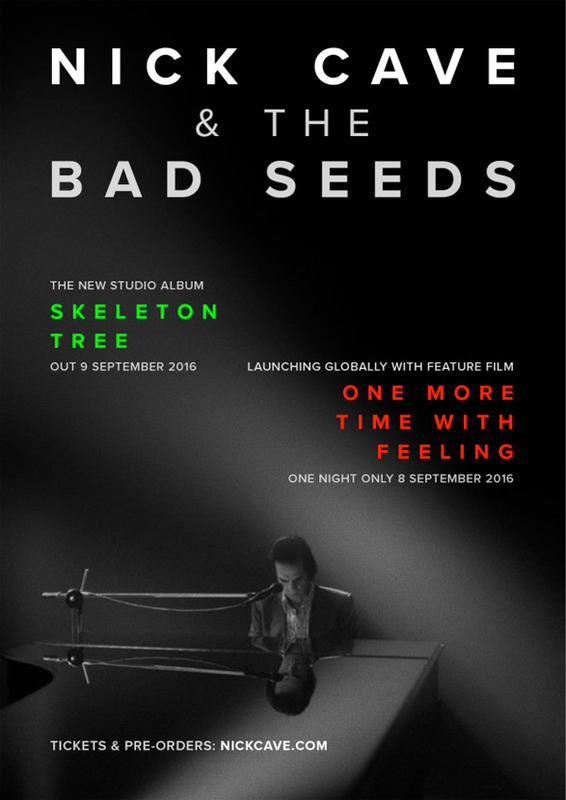 The first trailer has debuted for a documentary called One More Time With Feeling, made by The Assassination of Jesse James director Andrew Dominik, which follows Cave producing his new album titled "Skeleton Tree" (out in September). The trailer is entirely in black & white, but the feature-length doc has both color and B&W footage as well as 2D and 3D footage, showing Cave working in the studio and outside as well. The footage in this looks stunning, and I'm a huge fan of Andrew Dominik, so I'll probably catch this just to get a glimpse at his most recent work. The "other" Nick Cave doc was called 20,000 Days on Earth and played throughout festivals in 2014-2015, earning mostly positive reviews for being a unique creation. This one is also unique. Official description: "Originally a performance based concept, One More Time With Feeling evolved into something much more significant as Dominik delved into the tragic backdrop of the writing and recording of the album. Interwoven throughout the Bad Seeds’ filmed performance of the new album are interviews and footage shot by Dominik, accompanied by Cave’s intermittent narration and improvised rumination." One More Time With Feeling is directed by New Zealand filmmaker Andrew Dominik, of the films Chopper, The Assassination of Jesse James by the Coward Robert Ford, and Killing Them Softly previously. The doc will show in theaters for one-night-only on September 8th later this fall, timed with the release of the new Nick Cave + Bad Seeds album. For theater locations, visit the film's official website here. Who's interested? I always appreciate and dig a Nick Cave joint. Genius is such an overused term these days, so I won't call him that tonight. But I can't think of another artist whose music I rather not live without like his. He seems to keep doing it better and better after all these years. I can't wait for the new record!